Afun-Ogidan, D., and F. de Weijer. 2012. 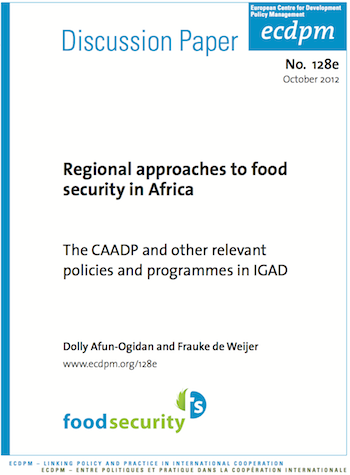 Regional approaches to food security in Africa: Early lessons from the IGAD Regional CAADP process (ECDPM Discussion Paper 128e). Maastricht: ECDPM. Between 2010 and 2011, parts of the Horn of Africa experienced some of their worst droughts in history and this prompted Heads of State and Government from Intergovernmental Authority on Development (IGAD) and the East African Community (EAC) to come together to endorse a more preventative, regional and holistic approach towards ending drought emergencies in the region. The Summit gave birth to the IGAD Drought Disaster Resilience and Sustainability Initiative (IDDRSI) and a number of related initiatives aimed at operationalizing the drought resilience agenda in the region’s Arid and Semi-Arid Lands. Since 2003 the Comprehensive Africa Agriculture Development Programme (CAADP) had been established by the assembly of the African Union (AU) aiming to raise agricultural productivity by at least 6% per year and increasing public investment in agriculture to 10% of national budgets per year. After an initial phase focused primarily on interventions at the national level, there is growing awareness on the need to work more on the regional dimensions of the CAADP. In this context, ECDPM has undertaken policy-oriented analysis and stakeholder consultations on regional CAADP processes as well as on its linkages with the broader regional integration dynamics, in various African regions. This paper focuses on the IGAD with the objective to stimulate further discussions among involved stakeholders, to contribute to the consultative processes around the development and implementation of CAADP at regional level, as well as to contribute to lessons-sharing across Africa on regional approaches to food security. Stakeholders were not fully clear on how various on-going drought resilience initiatives are linked and will be implemented over time. It is important for key regional stakeholders to jointly agree on how the different processes can complement each other through a road map for coherence and complementarity. In order to build on the existing processes and to gradually mainstream them, there needs to be a utilisation of the same resource base (consultants, institutions, fora, stakeholders) through time. The CAADP could be a useful framework if it is used at its most flexible and the synergies should be identified and promoted between the regional CAADP compact and ongoing initiatives.